Hildegard of Bingen, Germany, was born in 1098: not really a time for women to receive much respect, or indeed to have the freedom to do anything worthy of respect. Hildegard’s life was ground-breaking for many reasons, and it left behind a legacy of timeless artistic works. Hildegard, the tenth child in her family, was sickly. She had frequent and accurate visions and premonitions from the age of three, but generally hid her strange ability from her family. It was customary in those days to to give the tenth child to the church as a ‘tithe’, so at the age of eight, the unusual girl was sent to an anchoress for religious education. The anchoress, Jutta, was very beautiful and came from a wealthy family, but she decided to give her life to God. Rather than the relatively easy option of entering a convent, she chose the anchor life. She received her last rights, and was committed to a cell adjacent to a church, carried on a funeral bier, from then on considered dead to the outside world. The cell was the extent of her outer life, so her time was spent in contemplative worship. There would probably have been a small window through which she received food, but there was also door, through which only Hildegard was allowed to pass. Hildegard was somewhat frustrated by the inadequacy of her training, but it continued until she was 38, when Jutta died. Hildegard continued to lead her growing convent from that tiny room. She had talked about her visions only to Jutta, who in turn had told Volmar, Hildegard’s tutor (later her secretary). In 1141 she heard a message from God to write down what she saw and heard. This sparked a time of inner turmoil and doubt, as well as physical illness, but with encouragement from Volmar, she did start to write. Her visions were accompanied by what we now call migraines. The 12th Century saw many eccentrics preaching unconventional ideas in order to gain a large following. Hildegard abhorred this practice, and worked hard to have her writings officially accepted by the church. Pope Eugenius fully encouraged her to continue, and with his blessing she was able to complete her first work: ‘Scivias’ (‘Know The Ways of the Lord’), which took ten years to write. 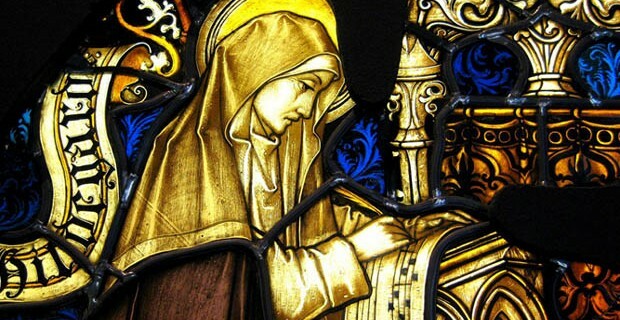 Hildegard founded a second convent, and her creativity flourished. Most of her musical works were plainchant and antiphons, but she also wrote musical plays for the nuns. It was a completely new art form at the time, but over the centuries it developed into what we know as opera. Her music is mainly monophonic, and exquisitely angelic. Music was extremely important to her, and seemed to be the most accurate way she could record the subtle Heavenly atmospheres in her visions. Eighty of her compositions have survived, and she remains the earliest composer whose biography is known. Modern recordings by Sequentia have brought this pure and visionary art form back to life. Hildegard was also a scientist, basing her many botanical, medical and geological dissertations on Greek cosmology and the relationships between the elements. She was a powerful, well-respected, and highly educated woman, which was extremely rare in her day. Many abbesses and abbots looked up to her for blessings and guidance. She communicated with Popes, statesmen and emperors who respected the wisdom of her opinions. Her life was an inspirational triumph: for music, spirituality and womanhood. The cyclone derives its powers from a calm center. So does a person.